Requirements: xor key used to encrypt shellcode should not be present in final encrypted shellcode. Some way for decryption algorithm to detect end of shellcode. Purpose of the function is to xor encrypt a given plaintext shellcode. Requires two xor key bytes. First xor key should be random while second xor key is fixed. Each byte block of the shellcode is encrypted with a unique shellcode-xor-key byte that isn’t known to the caller of the function. To decrypt, you need to know fixed xor key and random xor key used. Reason random xor key was used was so that decryption key is not contained as plaintext in final encrypted shellcode. Parameters: Random xor byte key, fixed xor byte key, bytearray of plaintext shellcode. Returns: Prints to screen encrypted shellcode with two prepended bytes, encrypted byte of shellcode length, and temp xor key. Here is the full code listing with the decryption function. Purpose: Proof of Concept Python shellcode XOR encoder. Paste your shellcode into the script and an the newly generated shellcode will be printed to the console. Has ability to create new shellcode everytime because shellcode key is random, well kind off, it's 8 bits long. Shellcode encryption key is not included in final encrypted shellcode. Decryption involves knowing xor_fixed_key and guessing shell_key. Limitations: Original shellcode cannot be larger than 255 bytes. This is because a single byte is used to hold shellcode length. Know plaintext weakness. shellcode with strings like /bin/sh will be easy to identify. If xor key is same as xor'ed shellcode byte then result is 0x00. This makes it trivial to identify xor key if run against known plaintext. Note: This code is intended for education purposes and not for real world use. This is not real encryption. TODO: Implement decryption algorithm in assembly with xor key cracker functionality. This is to ensure that xor key is not hardcoded. Purpose: XOR encrypt shellcode. Requires two xor key bytes. First xor key is random while second xor key is fixed. Each byte block of the shellcode is encrypted with a unique shellcode xor key byte that isn't known to the caller. 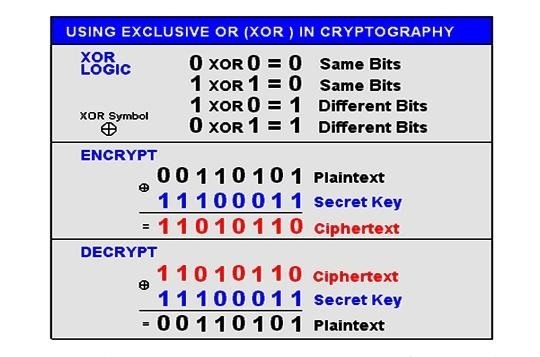 To decrypt, you need to know fixed xor key and random xor key used. Reason random xor key was used was so that decryption key is was not contained plaintext in encrypted shellcode. Parameters: Fixed xor byte key, bytearray of plaintext shellcode. Purpose: retrieve shellcode encryption keys. Bruteforce 255 possible keys. Let’s run the code on a simple execve shellcode. Shellcode len: 23 + 2 bytes for length and temp_key prefix bytes 25. These keys are not present within the encrypted shellcode output. The decryption is basically running through the same function with the same keys but using the encrypted shellcode as the bytearray. This should reverse the process of the xor function. As we can see the shellcode matches the original shellcode.